As described in the OTRS documentation it is possible to take customer information, for example from an LDAP Backend, to a dynamic field when a ticket is created or the customer is changed. This could later be used for reporting and would preserve the value from the time of ticket creation, even when it is changed in the LDAP backend. Unfortunately the documentation is not that detailed, especially if you new to OTRS. So here is a little more information on how to do this. In my case I have the cost center information in the Active Directory field departmentNumber which I’d like to preserve for each ticket, for future reporting. I’d like to show the cost center information on Free Text pop up and on Ticket Zoom in the Ticket Information area. If you already have one of the settings mentioned, you have to add the new values instead of adding the entire setting, otherwise it will only take the last value from the Config.pm and ignore other settings. 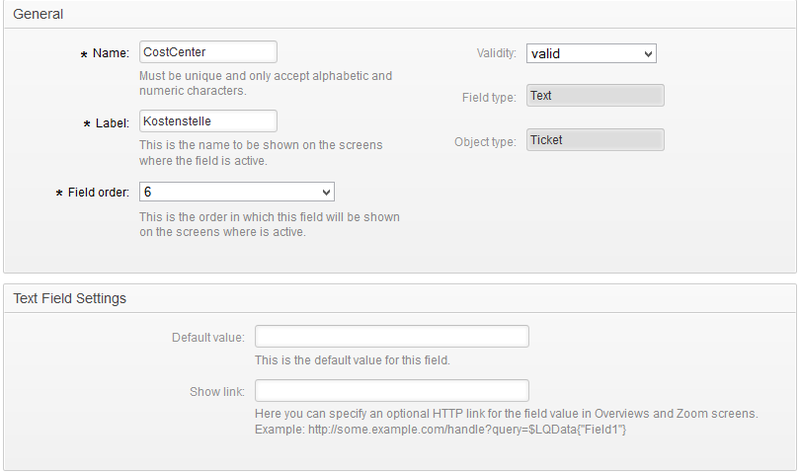 The mapping references the var from the Customer backend mapping with the name of our DynamicField. Thats it. You can test it by changing the Customer of a Ticket, the Info should now be in Ticket Free Text and in Ticket Zoom. This entry was posted in Open Source, OTRS on January 20, 2015 by Stephan Lang.